With the recent conclusion of three simultaneous massive open online courses (MOOCs), the Knight Center for Journalism in the Americas has reached an important milestone in its innovative distance learning program. As of this month, the Center has served more than 100,000 students around the world. 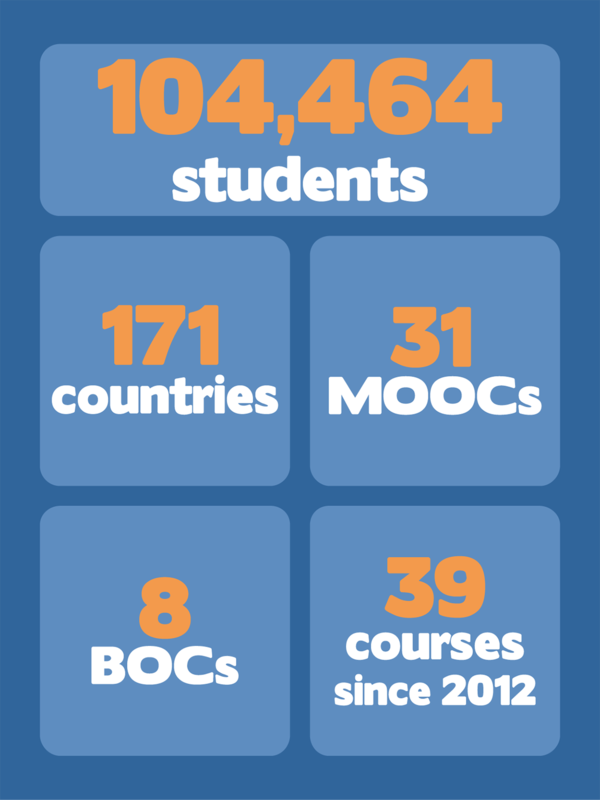 In less than five years, since launching its first MOOC in October 2012, the Knight Center has served 104,464 students from 171 countries with 31 MOOCs and 8 BOCs (big online courses). A MOOC is a free course that reaches thousands of people with a more general or introductory topic. By contrast, a BOC is tailored to a few hundred students with an intermediate or more advanced topic. The three simultaneous courses that recently concluded focused on using the Python programming language for data journalism, fact-checking and verifying public discourse, and freedom of expression jurisprudence in Latin America. For the fifth time, the Knight Center offered a course on the “International Legal Framework on Freedom of Expression, Access to Public Information and Protection of Journalists” in conjunction with UNESCO and the Office of the Special Rapporteur on Freedom of Expression of the Inter-American Commission on Human Rights (IACHR). The four previous editions of this course, which is taught in Spanish, reached more than 3,000 judges and justice operators. However, this edition alone counted 2,200 students from 19 Latin American countries, plus the U.S. and Spain. Cristina Tardaguila of Brazil’s Agência Lupa – the first fact-checking agency in Brazil – led the first massive course in Portuguese for fact-checking. This course, which reached more than 2,900 students, was the fifth MOOC produced as part of an alliance between the Knight Center and Brazil's National Association of Newspapers (ANJ), and the seventh sponsored by technology giant Google. Aline Louise, a student in the course who is working on her Master’s degree in communications sciences, wanted to know more about fact-checking in Brazil and around the world, as well as to share experiences. The Knight Center just announced another new course in Portuguese in partnership with ANJ, which also counts on support from Google News Lab. Returning instructor João Wainer, former editor of TV Folha, and Alessandro Alvim, assistant editor of Globo, will teach “Video journalism: Visual Narratives for Digital Platforms.” The course starts July 24 and registration is still open, so sign up now. Also this year, "Python for Data Journalists: Analyzing Money in Politics,” taught by Ben Welsh, editor of the Los Angeles Times Data Desk and co-founder of the California Civic Data Coalition, attracted 2,737 students from 122 countries -- a surprise given the complexity of the topic. For the first time, students of the Center’s MOOC program learned how to use Python scripting and different applications to access and analyze large data sets. Another innovative part of this course was the incorporation of a smaller class within a class for students located in California. During the course, the journalists met with Welsh in person for study groups at the LA Times. Now that the course is finished, they are forming a special group to dive further into the data, looking more specifically at money and politics in California. Aleszu Bajak, an adjunct professor at Northeastern University’s School of Journalism and editor of Storybench.org, said he’s been a fan of the Knight Center MOOC program since taking veteran instructor Alberto Cairo’s popular “Introduction to Infographics and Data Visualization” course in November 2015. “His insights on design and data, and Ben Welsh’s Python course, have been valuable in helping me develop curricula at Northeastern,” Bajak said. Marketplace reporter Sally Herships signed up for Welsh’s course because of Python’s promise as an investigative tool. Unlike a short workshop, the class was “a chance to interact at greater depth and for greater length,” she said. Herships is hoping to incorporate Python into her reporting. The Knight Center celebrated the fourth anniversary of its MOOC program in November 2016, having reached 85,000 students. Since then, the Center has launched pioneering MOOCs on virtual reality and 360 video, in addition to the Portuguese course on fact-checking. Robert Hernández returned to the distance learning program to instruct more than 2,400 students on immersive journalism, teaching some lessons in 360 degrees through interactive videos. Cairo, who taught the first Knight Center MOOC in 2012, was co-instructor of the new course “Data Exploration and Storytelling: Finding Stories in Data with Exploratory Analysis and Visualization” with Datassist founder Heather Krause. The course attracted 6,503 students. Zurairi AR, assistant news editor and columnist at Malay Mail Online, registered for the course with the hope that it would expand his skill set for creating data-driven journalism (DDJ). Using what he’s learned from the MOOC, AR said he is part of a “bootstrap operation” to incorporate data-driven journalism into newsroom operations and coverage. “With this, Malay Mail Online hopes to join the ranks of several other Malaysian news outfits that aim to elevate data-driven journalism here,” he explained. Like all Knight Center courses, this year’s students have taken advantage of video lectures, handouts, exercises, quizzes and discussion forums. Some instructors also hosted informal question-and-answer sessions on Facebook Live. In April 2016, the Center received a $600,000 grant from the John S. and James L. Knight Foundation to expand its online journalism education program over the following four years. The Knight Center for Journalism in the Americas was created in 2002 by Professor Rosental Alves, Knight Chair in Journalism and UNESCO Chair in Communication at the School of Journalism at the University of Texas at Austin. The Knight Center’s distance learning program continues with support from the John S. and James L. Knight Foundation, the Moody College of Communication at the University of Texas and other donors; as well as income from registration fees and the issuance of certificates.